With this 14K white gold unicorn charm pendant from Apples of Gold Jewelry, you can wear your dreams and stay in touch with your inner self while being fun and exciting! This beautiful pendant is made from 14K white gold and weighs approximately 2.03 grams. Made in the U.S.A., this pendant is approximately 1" tall and 5/8" wide, and features a shining white gold unicorn with its two front legs raised into the air. The unicorn's horn, mane, and legs are detailed nicely. This pendant would look beautiful when paired with your favorite chain! 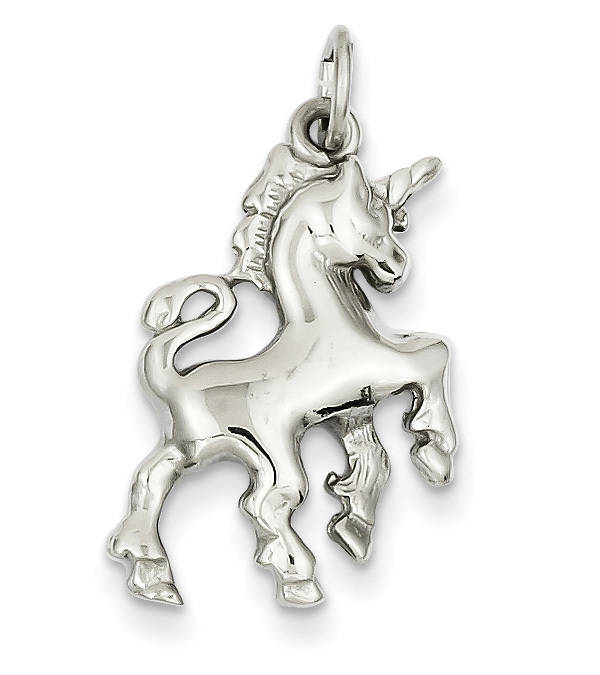 We guarantee our 14K White Gold Unicorn Charm Pendant to be high quality, authentic jewelry, as described above.